How do mornings with a cup of coffee on your screened porch, overlooking the 12th green sound? Everything is better with a view like this! 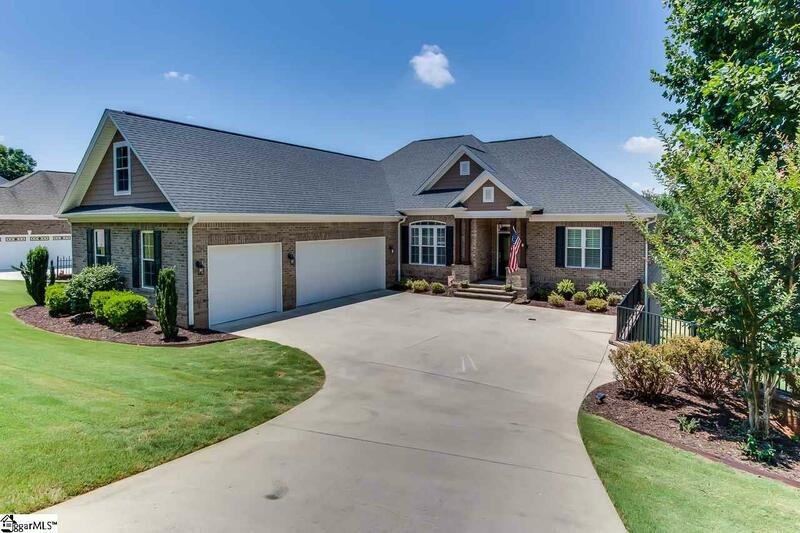 Brookstone Meadows is now offering this executive home - complete with comfort lifestyle spaces like an in home theater, exercise room and office. Inside this custom built 4300 Sq ft home, you are welcomed with hardwood floors, vaulted ceilings and massive stone fireplace with custom built ins on both sides. Walls of windows offer panoramic views of the course and long range views of the rolling hills. The open floor plan leads you into a true chefs kitchen. You will notice the double ovens, custom maple cabinetry, granite counter tops, oversized butcher block island and 5 burner gas cooktop. Meals can be enjoyed in the formal dining room or casually from the breakfast area, screened porch or covered balcony. The master bedroom and en suite are a true sanctuary. Boasting double trey ceilings, two closets and access to the screened porch, the privacy and comfort leave little to be desired. Enjoy a spa experience in the oversized glass enclosed shower, featuring multiple shower heads and a luxury rain feature. On the opposite side of the main level you will find 2 additional bedrooms and a full bathroom. Need more space for entertaining? The exquisitely finished basement is where you will love entertaining or even housing long term guests. A kitchenette with bar makes gatherings a dream: granite counter tops, refrigerator, sink and wine cooler. You will also enjoy a designated home theater room with 109" projector screen and stadium seating perfect for movies or watching your favorite team win a game! Enjoy the freedom of working out conveniently in your home gym or get a head start on work in your home office. Additionally, the home features an alarm system, 3 car garage, full double door entry crawl space, separately metered irrigation system and on-Q speaker system through the entire house. Community features include large pool, 2 tennis courts, basketball court and nature trails. *Square footage and year built are per CRS. Listing provided courtesy of Scott Woodbury of Bhhs C Dan Joyner - Anderson.